This one will pump you! Get two medicine balls, light to medium weight. Start with a single ball and set up an easy pass with your partner. Warm up and emphasize quality movement. Move from a powerful position with knees bent, engage your core, etc. Make good throws and establish rapport. 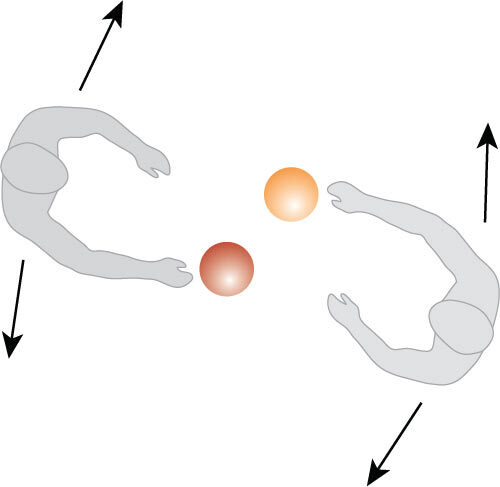 Challenge your partner with throws that are just at the perimeter of his or her range. Now start moving left and right, forward and back as necessary. Now add the second ball and away you go! If you drop a ball, keep moving. Try to integrate the recovery into the flow.